All Natural Fritos Hot Bean Dip with Jalapeno Peppers is an excellent dip for parties, family barbecues or as a simple snack when you're craving chips. 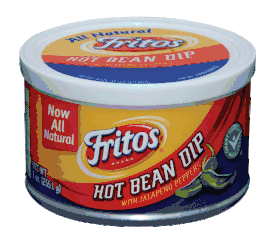 Just bring out Fritos Hot Bean Dip with Jalapeno Peppers and you'll be the life of the party. With a spicy delicious taste that isn't too intense, you'll enjoy the crunch of Fritos. Now you can buy the All Natural Fritos Hot Bean Dip with Jalapeno Peppers at MexGrocer.com. When choosing a bean dip, Fritos brand Bean Dip is a smart choice because it has only 1 gram of fat and 35 calories per serving. Please refrigerate after opening. Ingredients: water, pinto beans, jalape�o peppers, corn oil, vinegar, salt, corn maltodextrin, dehydrated onion, sugar, red pepper, chili pepper, dehydrated garlic, natural green bell pepper flavor, natural garlic flavor, and natural onion flavor. Fritos Dip de Frijoles con Chiles Jalapenos es el dip ideal para las fiestas, barbacoas familiares o como una simple botana cuando tengas antojo de papas. 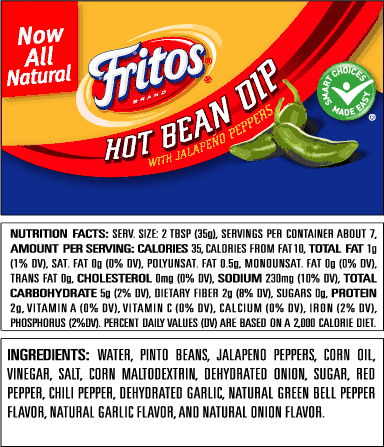 Simplemente pon el dip de frijoles con chiles jalapenos de Fritos y seras el alma de la fiesta. Tiene un sabor delicioso que no es demasiado intenso y que disfrutaras con los crujientes Fritos. Ingredientes: agua, frijoles pintos, chiles jalape�os, aceite de ma�z, vinagre, sal, maltodextrina de ma�z, cebolla deshidratada, az�car, piment�n, chile, ajo deshidratado, sabor natural de pimiento verde, sabor de ajo natural y el sabor natural de la cebolla. This product needs to be in the store here in Northern Wisconsin.